Pre-finished flooring has become quite a big deal in the last decade or so. Pre-finished flooring is solid hardwood flooring that comes already sanded, sealed, and ready to nail into place. After the flooring installers have completed their job, literally the only thing you need to do is sweep up, and you're ready to go. Unfinished and pre-finished flooring is installed the same way, give or take a few minor differences. With pre-finished flooring, the installers should take more care because any scratches and dents are virtually non-repairable. That is why you will see installers flatten out the flooring cartons and use them as a pad to place their tools. The chief feature of pre-finished flooring is its thick, multiple layers (over 5) of urethane coating. When you sand and seal your own flooring, you do so by hand, and the coatings are not as uniform. But the pre-finished is quite something else. If you are unfortunate enough to have a chipped or broken pre-finished board in your carton, you can quite clearly see the plastic-like layer coming off of the board. It is almost like onion skin (but a tough onion skin!). This type of solid aluminum oxide-impregnated urethane finish is something that only a dedicated factory can apply. No Smell. With pre-finished flooring, there is no mess and smell associated with finishing the floor within your living environment. Better Coating. The pre-finished urethane coat provides a thicker, more uniform coating than can be done manually. Turnaround Time. Quicker turnaround time. In fact, there is no turnaround time. Sweep and you're ready to go. Zero Sanding. No sanding needed. Floor sanding is far dustier than you might ever imagine, with dust invading nearly every part of your house. Ease of Purchase. Finally, take into consideration that because pre-finished flooring is becoming ubiquitous, it is easier to find pre-finished than unfinished floor. Difficult to Repair. If pre-finished hardwood flooring gets scratched or dented during installation, you have no option but to replace the entire floorboard. Forget the notion of trying to fill, sand, and re-seal with your own coating. It cannot be done; there is no way you can ever manually duplicate the factory coating. Floor Installation a Delicate Process. The previous disadvantage entails that the flooring installers be extra-careful when installing your floor. Due to the heavy materials and tools involved, this is practically impossible. Result: damaged floors, to one degree or another. Seams. Seams between pre-finished floorboards are not sealed over, as they would be when you seal your flooring on site. Difficult to Refinish. Pre-finished flooring rarely needs refinishing due to its heavy coating. But when it does need a deep, drum sanding, the process will rip off an awful lot of wood to remove those 5+ layers of factory baked-on urethane finish just to reach any kind of bare wood. You will need to get all of that urethane off so that the wood will accept the new sealant. 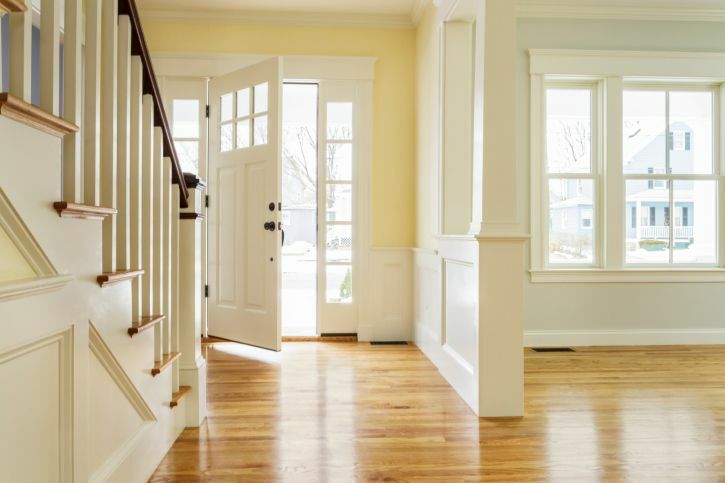 Is a Prefinished Hardwood Flooring Right for You? Is Sandstone Flooring the Best Option For You? Can You Add Padding Under a Wood Floor?